“The Greenwell Farms ohana welcomes Brad and looks forward to his retail expertise in marketing and promotions. We believe he possesses the dynamics and enthusiasm necessary to take us to a new level of business and customer service,” general manager Tom Greenwell said. Originally, Wohlman hails from the state of Washington, where he had a career in law enforcement. Prior to that he was a retail business owner and manager. Tours share with visitors the Greenwell Farms history while demonstrating how Kona coffee is grown and produced from start to finish. Tours visit coffee trees that were planted in 1900 and in contrast walk through a coffee field planted seven years ago and now in full production. Guests will also visit the wet mill and hoshidana’s, dry mill and the roasting house. Japanese guided tours are also offered. Concluding the tours, guests return to the retail center to taste freshly brewed Greenwell Farms 100% Kona coffee including many specialty roasts and flavors. The retail center – open daily 8 a.m.-5 p.m. – specializes in featuring Hawaii made products including organic honey, chocolate covered macadamia nuts, handmade coffee ornaments, logo apparel and more, perfect for taking home or sharing with family and friends. Today, Greenwell Farms is managed by fourth generation Tom Greenwell. 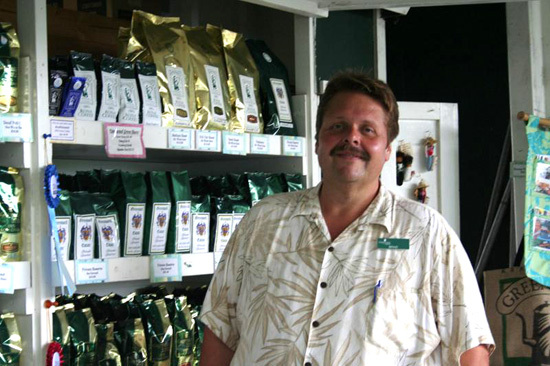 Greenwell Farms grows its own coffee, and operates its processing and visitor attractions on just under 100 acres of the most productive land in the Kona District. The company also purchases coffee cherry from more than 300 selected farmers from the Kona region.